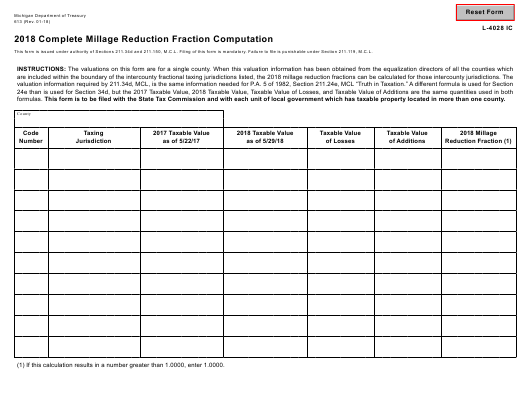 Form 613 is a Michigan Department of Treasury form also known as the "Complete Millage Reduction Fraction Computation". The latest edition of the form was released in January 1, 2018 and is available for digital filing. Download an up-to-date fillable Form 613 in PDF-format down below or look it up on the Michigan Department of Treasury Forms website. This form is issued under authority of Sections 211.34d and 211.150, M.C.L. Filing of this form is mandatory. Failure to file is punishable under Section 211.119, M.C.L. formulas. This form is to be filed with the State Tax Commission and with each unit of local government which has taxable property located in more than one county. (1) If this calculation results in a number greater than 1.0000, enter 1.0000.